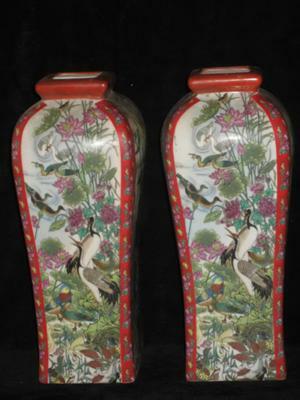 BIRDS AND FLOWERS VASES !!!!! 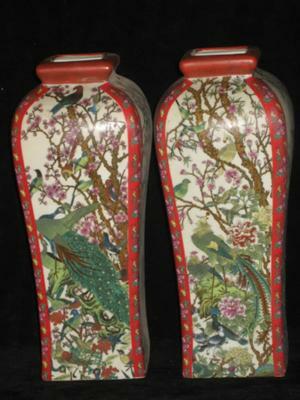 ARE THESE MIRROR IMAGE VASES ORIGINAL OR REPRODUCTION AND ARE THEY HAND PAINTED ??? SLIGHT DEVIATION OR PLACEMENT OF SILK SCREEN PRINT ??? ALIGNMENT IS OFF OR IS THE ARTIST THAT GOOD !!!!!!!???????? 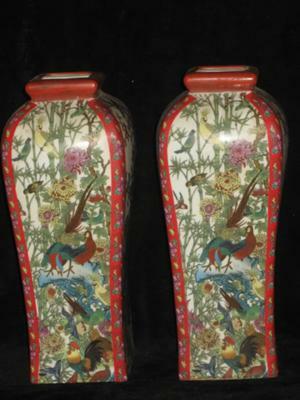 Comments for BIRDS AND FLOWERS VASES !!!!! I'M AN ARTIST AND THAT WAS MY INITIAL THOUGHT ALSO *** NOT HAND PAINTED *** MORE LIKE STENCIL OR SILK SCREEN !!!!!!!! NOT ORIGINAL !!!!!! This is probably pretty new. The dark foot rim is often made to look old. 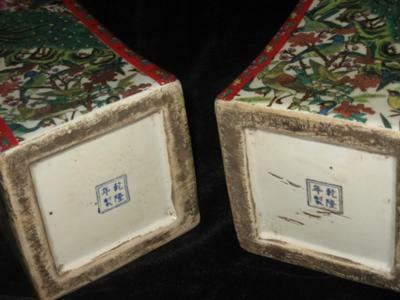 The red edges and neck look more Japanese, the mark seems to be a fake Chinese Qianlong mark put there for decorative purposes only. It couldn't really deceive anyone. The decoration looks quite unlike Chinese or Japanese antique art. I would think it is a modern Chinese product. From these small pictures it is impossible to tell if the vases are handpainted or printed, but if you compare single areas for differences, you can tell yourself. Don't look at the overall picture, but details. With handpainted items there are always differences, and usually it is pretty easy to detect. If there are many too many things the same, it is probably printed. Also, under a magnifier the single brush strokes are always clearly visible as such.